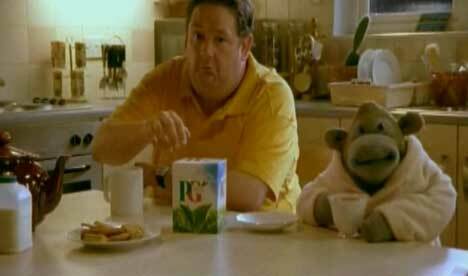 British comedians Johnny Vegas and Ben Miller return to TV screens as Al and the voice of Monkey, signalling a new advertising campaign for PG Tips. 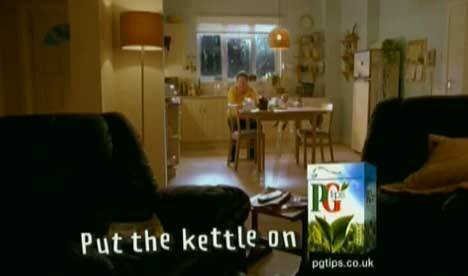 PG Tips screened a series of four TV adverts featuring the team in January 2007, picking up their partnership five years after their brief campaign with ITV Digital. The TV campaign coincides with a web-based Monkey Shop in which knitted monkeys, t-shirts, rucksacks and golf club covers can be bought, all proceeds going to Comic Relief. See our post on the Focus Pocus interactive quiz site. It’s a dark and stormy night. (Excuse the cliche). The front doorbell rings. And who should open the door but Al, a hero in black mask and cape. “Stand and deliver!” “Hello Al”, comes the voice from a knitted monkey figure in the rain. “I was in the rain and ah… any chance of a cuppa?”. Al and Monkey resolve to get back into the advertising business – for PG Tips. Even if it means sharing a house with Carol Decker from the popular British 1980s band T’Pau singing “China in Your Hand” all day long. Monkey and Al dressed in Home Guard uniforms reminiscent of the classic British TV comedy Dad’s Army. Monkey explains that at 15.00 hours they will drink a cup of PG Tips with naturally occuring theanine to help Al build a flat packed chest of drawers. Al completes the task but Monkey ends up with his head in the bottom drawer and his legs upside down in the middle drawer leading Monkey to quote “Stupid boy”, a reference to Private Pike. Monkey and Al dressed as carnival folk. Monkey is wearing a ballerina’s tutu and is tied to a rotating wheel while Al throws teaspoons, instead of the expected knives, at the rotating Monkey who pleads with Al to “stop this madness”. Al tells Monkey not to fear because he’s in the zone because of the naturally occuring theanine in PG Tips. Once Al runs out of spoons, he reaches for other kitchen tools (egg whisk, spatula, etc.) and asks Monkey if he’d prefer a blindfold. Monkey agrees but then Al wears the blindfold instead leading Monkey to cry “No idiot, for me. Put the blindfold on me!” The now blindfolded Al says “Who says that?” and walks into the kitchen table. The PG Tips Return of the Monkey ad was developed by a creative team at Mother, London, with agency producers Richard Firminger and Angela Eleni. Mother was responsible for the original DigitalTV monkey campaign, in which viewers could obtain a knitted monkey puppet by signing up for the digital network service. Filming was directed by Daniel Kleinman via Rattling Stick with producer Johnnie Frankel and director of photography Ben Davis. Media planner was Mike Mulholland at Mindshare. Editing was by Steve Gandolfi of Cut+Run, London. Music was composed by Jamie Masters at Adelphoi. Post production was done at The Mill, London, by producers Austen Humphries and Fi Kilroe, Telecine Mick Vincent, Lead Flame Judy Roberts, Flame artist Rich Betts, Flame Assists Paul Wilmot, Dave Birkhill and Leon Woods, and 3D Producer Steve Boose. Most of the work involved rebuilding scenes to remove evidence of puppeteer Nigel Plaskitt and rigging. See more on the Mill work at Pluginz magazine. PG Tips at Wikipedia includes a rundown on the monkey adverts.